Dance instructor Kathryn Karipides demonstrates a dance move during the Yes…I Can (!) Dance class at the Mandel JCC in Beachwood. When Harriett “Taffy” Epstein learned that her friend’s daughter, Dr. Karen Jaffe, was diagnosed with Parkinson’s disease in 2011, she began thinking of ways to help. Epstein, who owned a nationwide dance boutique, died in June 2013, but during her last years of life was able to help launch the Yes…I Can (!) Dance class at the Mandel JCC in Beachwood. The Yes…I Can (!) Dance class is modeled after the Dance for PD program, a collaboration between the Brooklyn Parkinson Group and the Mark Morris Dance Group, an internationally acclaimed modern dance company in Brooklyn, N.Y. After reading an article in a magazine about the Dance for PD program, Epstein called Jaffe’s mother to pitch the idea of bringing the class to Cleveland. Kathryn Karipides, a professional dancer and choreographer who met Epstein in the 1950s, had also read about the Dance for PD program in The New York Times. 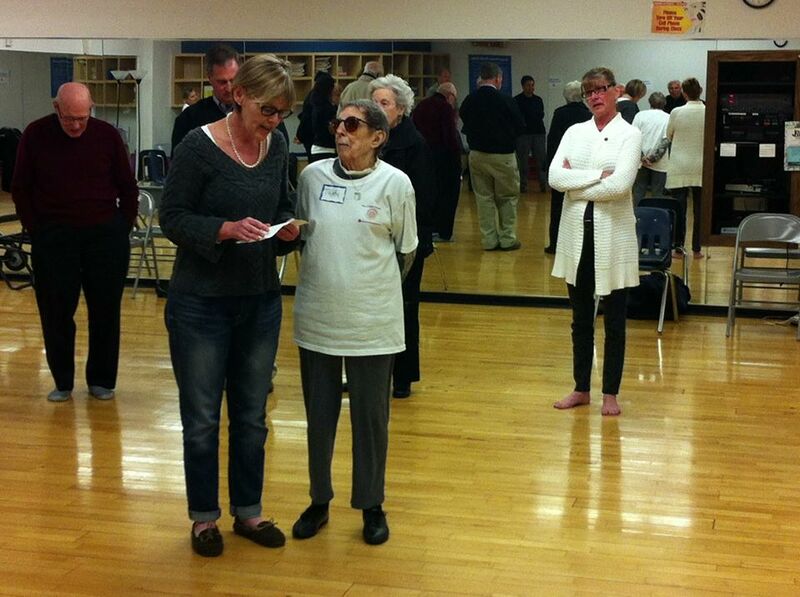 She thought bringing the class to Cleveland was a wonderful idea and convinced David Leventhal, program director and one of the founding teachers of the Dance for PD program, to teach a training workshop in Cleveland. With the help of DANCECleveland and Cleveland State University, about 40 local dance instructors were trained during the workshop in early 2013. Parkinson’s disease is a degenerative disorder that affects movement. Both the Dance for PD and Yes… I Can (!) Dance programs use dance moves to improve agility, balance and coordination for the participants. Jaffe admits she was skeptical when she first walked into the training workshop. But as live piano music filled the air, everybody started to move and dance. By the end, everyone was smiling. “We were dancing. It didn’t matter that we were sitting down. It was really remarkable,” Jaffe said. The class, which draws about 15 people, is taught by Desmond Davis, Heather Koniz, Joan Meggitt and Karipides. Meggitt, who was taught by Karipides in graduate school, was invited to be the lead instructor for Yes…I Can (!) Dance. She said the class focuses on flexibility, coordination, range of motion and strength. “It’s energizing. Anything that is moving the body, particularly in community with other people, really raises the level of energy and focus of the individual,” Meggitt said. Meggitt added that the program is a dance class, not an exercise class. Karipides emphasized the sense of community that develops in the class through the art of dance. Jaffe, who founded the nonprofit organization Shaking With Laughter in 2011 to fund Parkinson’s research, said Parkinson’s disease can be a very lonely diagnosis, since individuals often try to keep their disease a secret. The Yes…I Can (!) 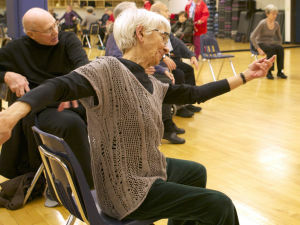 Dance class creates a safe environment for those with Parkinson’s disease.